This year, the LA County Fair is going on a bit of a nostalgia trip with a Route 66 theme. As an homage to the iconic highway, several vendors at the fair will be serving up special items that cost just $6.60. We’ve eaten our way through the entire fair and found some of the wildest $6.60 deal options that you can find. Each of these has visual pop and loads of flavor, making them worth putting both in your mouth and your Instagram feeds. Of course, there’s also plenty of regular items at the fair that are just as out-of-bounds, and you’ll want to check those out too. Below is a list of both $6.60 and other festival foods that are worth heading to the LA County Fair for. 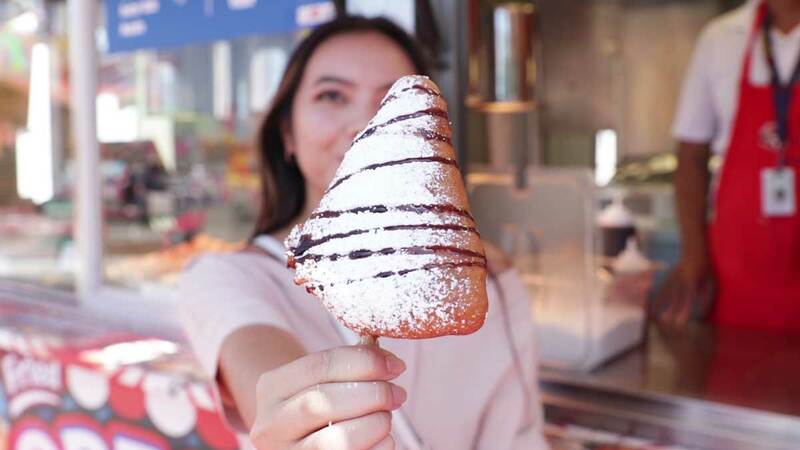 SoCal fair food legend Chicken Charlie is back at it, this time with a spicy, creamy mac & cheese waffle cone. 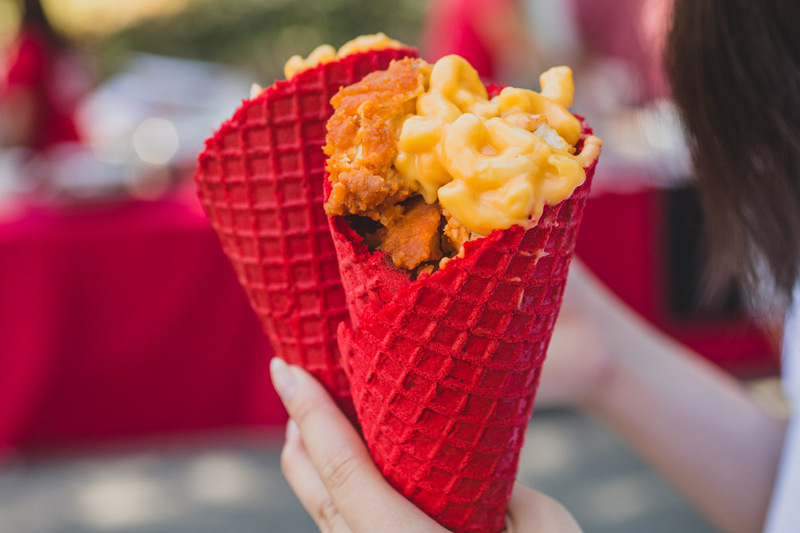 It’s a combo of spicy buffalo chicken with cheesy mac, piled inside of a hot rod-red cone that’s sure to catch some eyes. 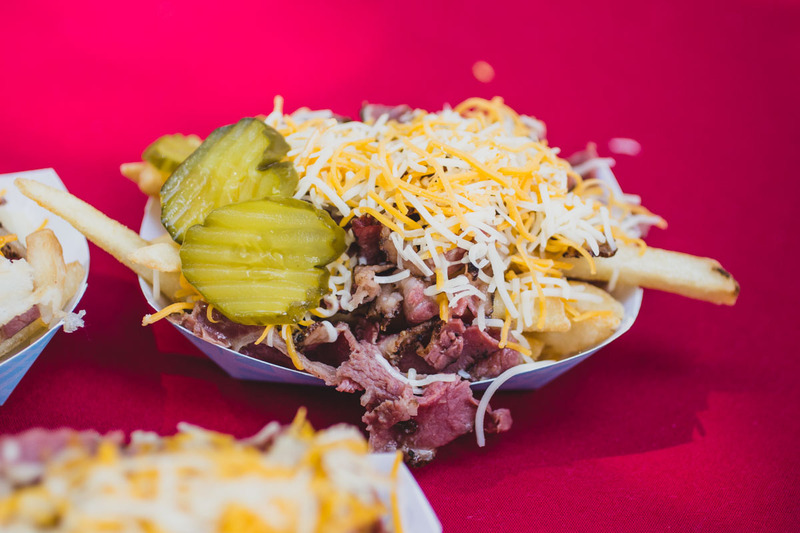 If you’re looking for loaded fries with a twist, these pastrami fries will satisfy that craving. Crispy spuds are loaded up with hot pastrami, a blend of shredded cheeses, and pickles. Nitro Snack Dragon Breath is bringing back this viral item from last year’s fair. 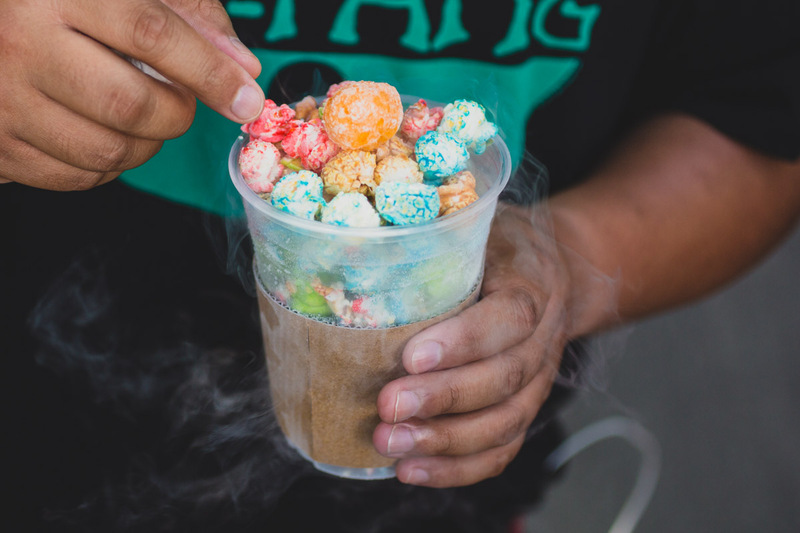 The kaleidoscopic popcorn is served after a dip in some liquid nitrogen, so you’ll be breathing “smoke” like a dragon when you take a bite. It’s not a fair unless something outlandish heads into the deep fryer. This time around, it’s a hefty slice of pecan pie that’s getting the treatment. Sour Bombs, wafer-like candies with sour powder in the middle, are also getting the liquid nitrogen treatment. Nitro Snack dips a stick of them into liquid nitrogen so they’re served at temperatures way below freezing, creating a smoky effect. If you’re looking for dessert, this is not the treat for you. But if you want BBQ, this IS what you’re looking for. 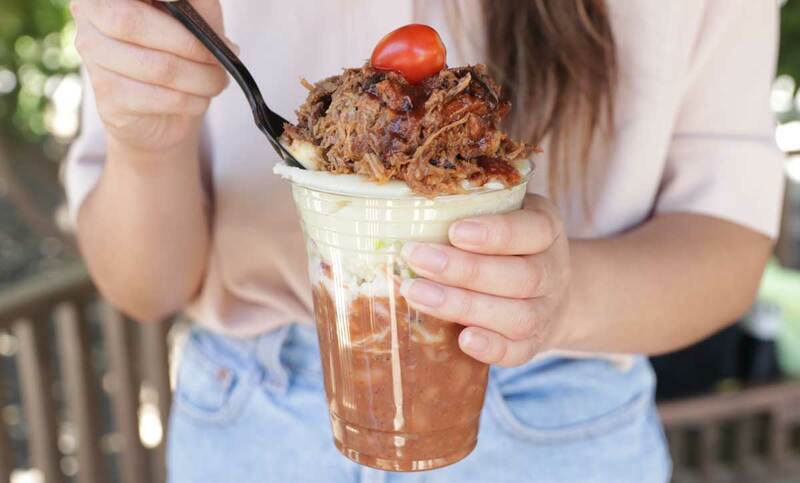 Chuckwagon’s “sundae” consists of beans, slaw, mashed potatoes, meat, BBQ sauce, and topped with a “cherry” tomato. 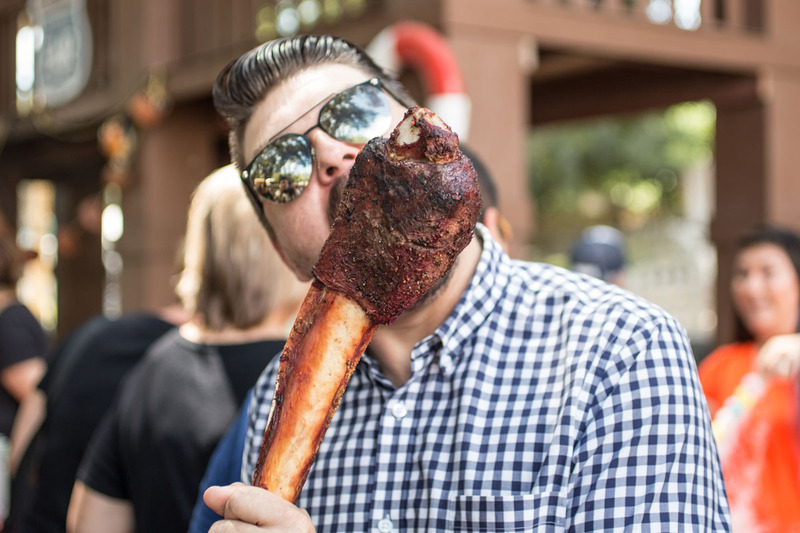 Biggy’s is selling a MASSIVE beef rib that you can show off to everyone. Mad props to anyone who struts around the fair chomping on this like a carnivorous badass. 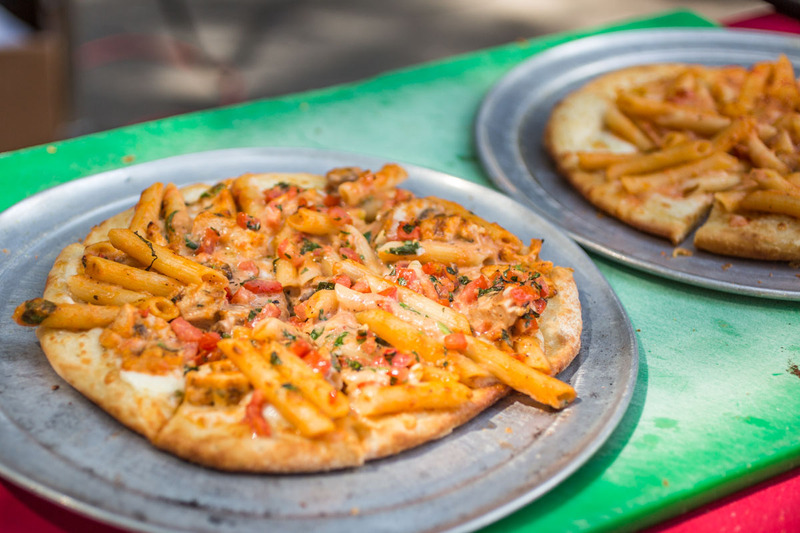 Pasta and pizza unite in this creative mashup of Italian foods. A creamy penne pasta is loaded onto cheese-covered pizza dough before taking a trip through the oven. 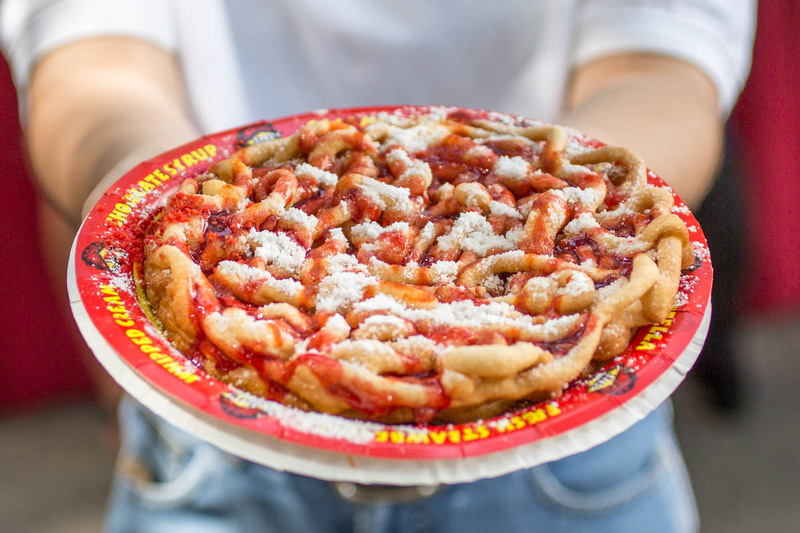 The classic combo of peanut butter and jelly gets piled onto a funnel cake, but with a spicy kick. A hit of sriracha is added to take this fair food classic to the next level. The LA County Fair runs through September 23rd in Pomona, CA. 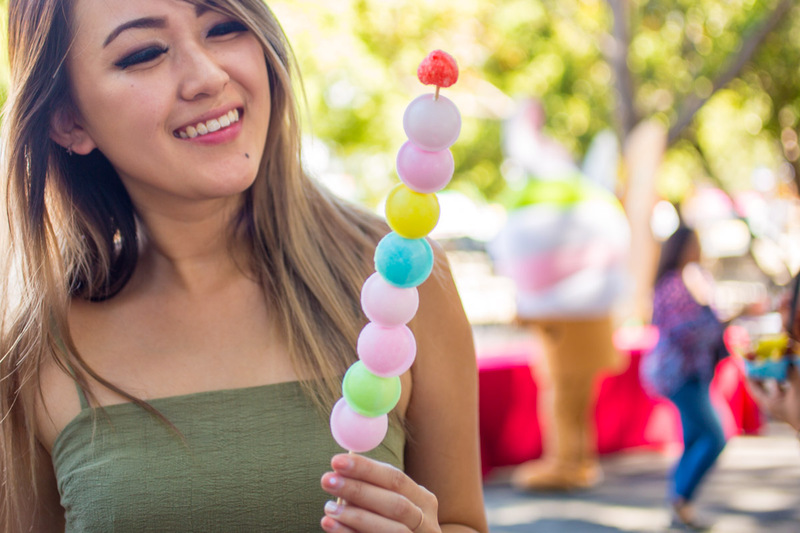 You’ve got until then to check out all of these crazy eats PLUS everything else the fair has to offer.